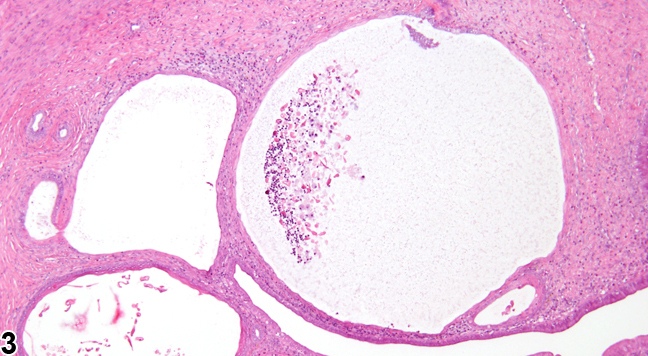 Uterus, Endometrium - Metaplasia, Squamous in a female Sprague Dawley rat from a chronic study. There are cellular debris and squames in uterine lumen, which is lined by squamous epithelium. Uterus, Endometrium - Metaplasia, Squamous in a female Sprague Dawley rat from a chronic study (higher magnification of Figure 1). There is squamous metaplasia of the endometrium with cellular debris in the uterine lumen and a few associated inflammatory cells. 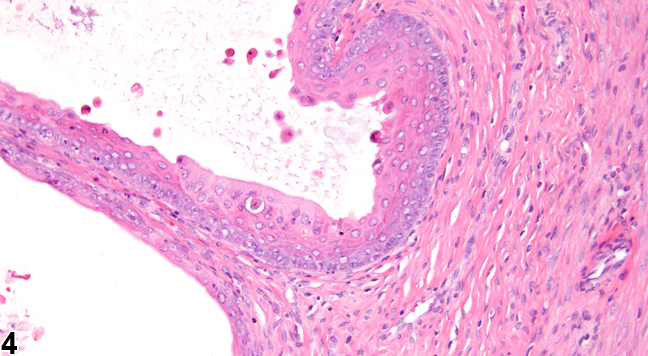 Uterus, Endometrium - Metaplasia, Squamous in a female Sprague Dawley rat from a chronic study. There is focal squamous metaplasia of the endometrium. Uterus, Endometrium - Metaplasia, Squamous in a female Sprague Dawley rat from a chronic study (higher magnification of Figure 3). There is focal squamous metaplasia of the endometrium. Uterus Endometrium - Metaplasia, Squamous in a female Harlan Sprague-Dawley from a chronic study. There is squamous metaplasia of the endometrium. 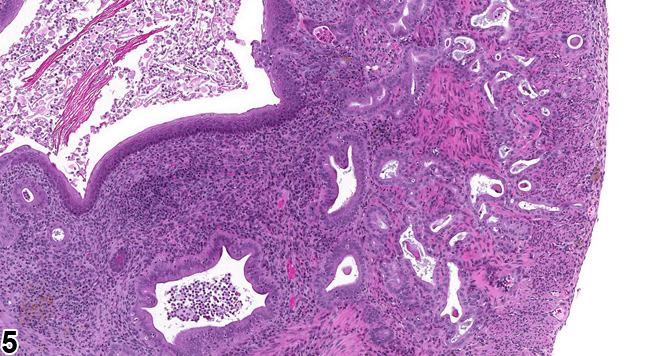 Uterus, Endometrium - Metaplasia, squamous, in a female Harlan Sprague-Dawley rat from a chronic study. There is moderate squamous metaplasia of the endometrium. 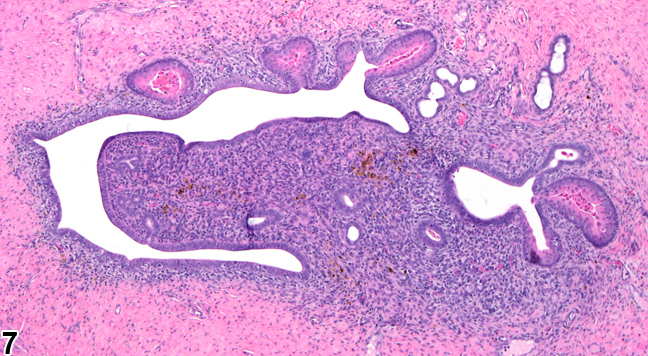 Uterus - Metaplasia, squamous in a female Harlan Sprague-Dawley rat from a chronic study. There is squamous metaplasia of the endometrial glands. 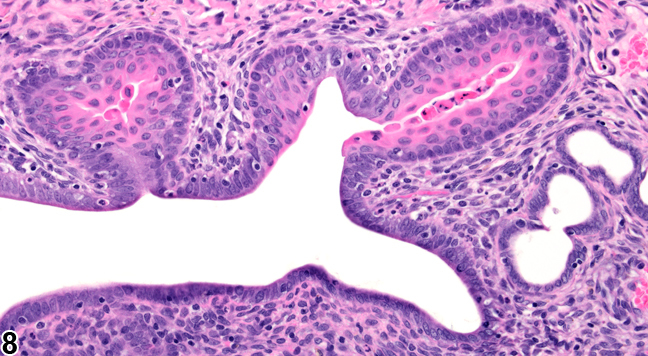 Uterus - Metaplasia, squamous in a female Harlan Sprague-Dawley rat from a chronic study (higher magnification of Figure 7). There is focal metaplasia of adjacent endometrial glands. 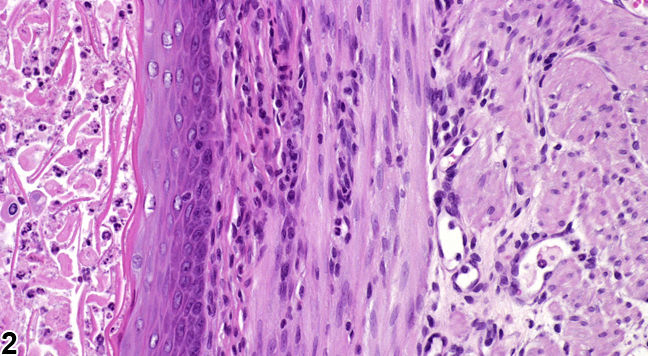 Squamous metaplasia of the endometrial epithelium ( Figure 1 , Figure 2 , Figure 3 , Figure 4 , Figure 5 , and Figure 6 ) can develop spontaneously and also occurs as a result of hormonal changes following administration of compounds with estrogenic activity, such as genistein, diethylstilbestrol, and dioxins. Vitamin A deficiency also causes squamous metaplasia. 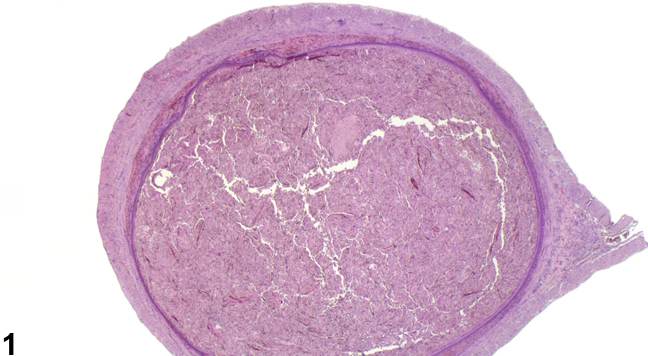 The lesion is characterized by the replacement of the normally columnar endometrial epithelium by squamous epithelium. In some cases, the endometrial glands can also be affected ( Figure 7 and Figure 8 ). Keratinization is not uncommon with squames and other cellular debris in the lumen. 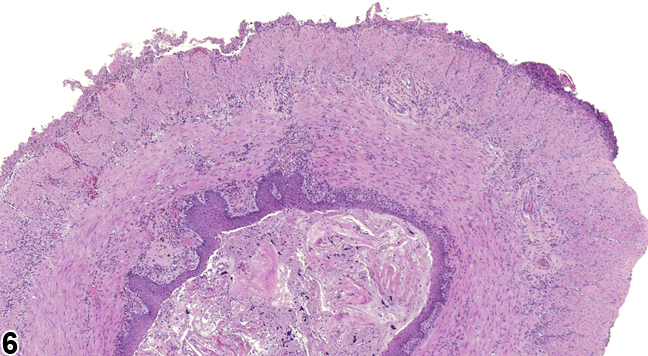 Inflammation and cystic hyperplasia of the endometrium are frequently seen with squamous metaplasia. Uterus, Endometrium - Metaplasia, Squamous should be diagnosed and given a severity grade whenever present. The modifier "squamous" should be included in the diagnosis to clearly define the lesion and eliminate potential confusion. Coexisting changes such as inflammation and hyperkeratosis should not be diagnosed separately unless warranted by severity. Gopinath C. 1992. Susceptibility of the uterus to toxic substances. In: Pathobiology of the Aging Rat (Mohr U , Dungworth DL, Capen CC, eds). ILSI Press, Washington, DC, 389-394. Gopinath C, Prentice DE, Lewis DJ. 1987. The reproductive system. In: Atlas of Experimental Toxicology (Gresham GA, eds). MTP Press, Lancaster, UK, 91-103. McClain M, Wolz R, Davidovich A, Pfannkuch F, Edwards JA, Bausch J. 2006. Acute, subchronic and chronic safety studies with genistein in rats. J Food Chem Toxicol 44:56-80. Yoshizawa K, Brix AE, Sells DM, Jokinen MP, Wyde M, Orzech DP, Kissling GE, Walker NJ, Nyska A. 2009. Reproductive lesions in female Harlan Sprague-Dawley rats following two-year oral treatment with dioxin and dioxin-like compounds. Toxicol Pathol 37:921-937.